The beautiful Venue and Restaurant is located in sunny South Maui on the Wailea Gold and Emerald Golf Course. Surrounded by rolling hills of the golf course and spectacular sunset views. Perfect Oceanview Wedding at the Right Price. Located on the Wailea Gold and Emerald Golf Course, the panoramic views from Gannon's Restaurant spans from the mountainside of Haleakala to the deep blue waters of the Pacific Ocean. Award-winning Chef Beverly Gannon and Chef Bret Pafford have collaborated in creating the perfect wedding menu for your special event. Gannon's can provide breathtaking ceremonies, delectable in-house catering, abundant amenities, and attentive staff, to ensure that your Maui wedding is everything that you’ve imagined. Our events team recognizes the importance of your wedding day so that no detail is overlooked. The outcome is an unforgettable occasion. From the rehearsal dinner to wedding ceremony and reception, Gannon's can provide the backdrop to memories that will last a lifetime. Every wedding is delicately planned and brought to life in surroundings of unparalleled natural beauty. To check availability or schedule an appointment, please email. The historical Plantation House is truly an extraordinary location. The quaint oceanfront plantation house (a time machine that feels like a museum) takes you back to the old Hawaiian plantation days. Your reception takes place under the stars in this magical setting. 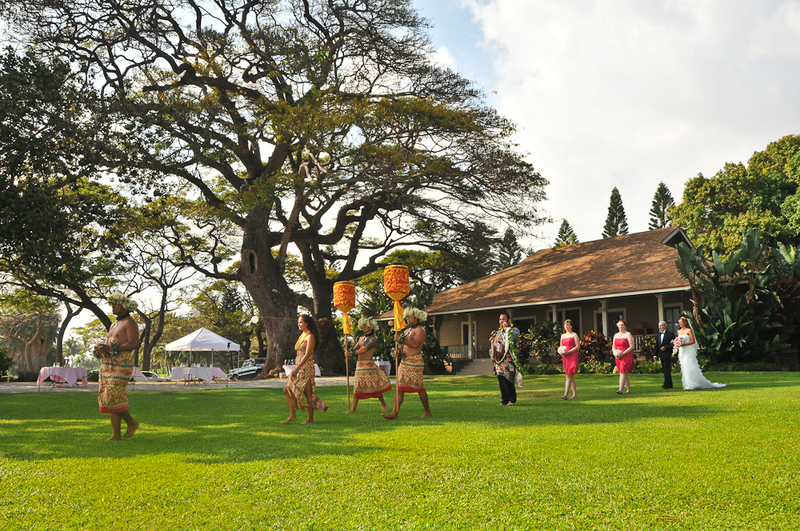 Old Hawaiian Plantation is a Fitting Setting for your Celebration! The quaint oceanfront restored plantation house is a museum of the old Hawaiian plantation days. This is where you are getting ready for your wedding. With a spacious lanai overlooking a large oceanfront lawn, your ceremony takes place on the tranquil lawn, and tall palms and soothed by the sound of the crashing waves. There's no need for fancy decorations here, as the ocean itself serves as the most majestic backdrop. After the ceremony, take a short stroll down to the beach to take advantage of the memorable photo opportunities the location offers. The lanai and the lawn can accommodate the celebration to follow. Enjoy the simple, natural beauty of the surroundings during your casual reception. Tiki torches and lights strung across the palms create a warm atmosphere that encourages a festive party. As the night falls, dance under the stars in this magical setting! We start with our Molokini Sunset Wedding service, fee for the private site, bamboo archway with floral decorations, seating, reception set-up, food and beverages, DJ and dance floor. You can customize your wedding with a number of options. Our Maui Villas Luxury Wedding package includes everything you want for your intimate beachside wedding all together; spectacular beachfront accommodations for up to 24 guests, a romantic private beach front wedding and delicious catered reception. Luxury Accommodations, Wedding, Reception, all in one place! Our Maui Villas Luxury Wedding package includes everything you want for your intimate beachside wedding all together; spectacular beachfront accommodations for the two of you and up to 22 guests, and a romantic private beach front wedding. Sleeps from 2-24 guests or more in the beautiful luxury beach front property. The package includes 5, 6 or 7 nights stay in from one to four individual units, each featuring 3 bedrooms and centered around a spacious courtyard with pool. 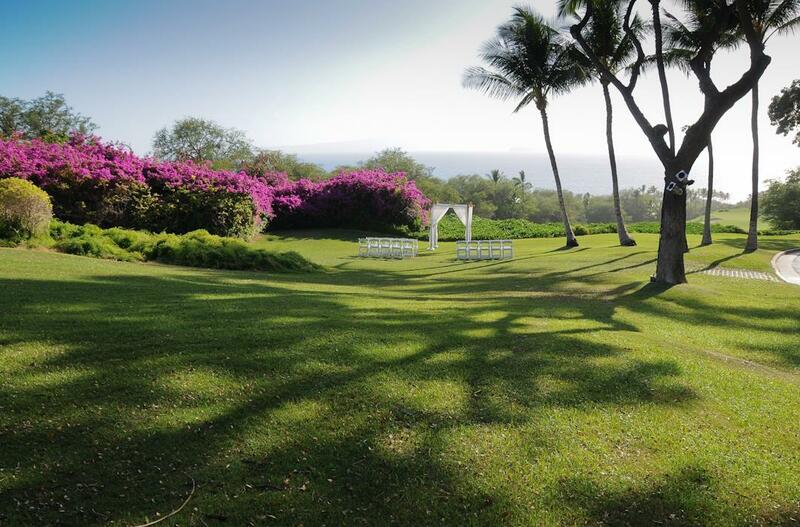 Your wedding takes place directly on the grass fronting the property. 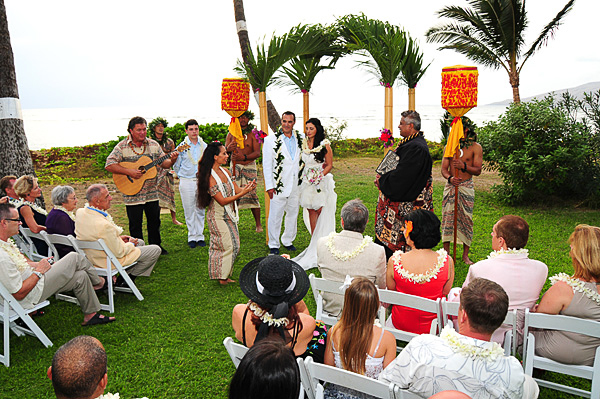 We start with our Molokini Sunset Wedding service, acccomodations for 5, 6 or 7 nights, your catered wedding and reception, bamboo archway with floral decorations, seating, reception set-up, food and beverages, and DJ. You can customize your wedding with a number of options.